For the third time in five matches, Port Adelaide has kicked more than 20 goals and enjoyed a win by over 80 points. The Power recorded 14 fewer disposals than the Lions but took the ball inside 50 on 29 more occasions, creating 23 extra scoring shots. 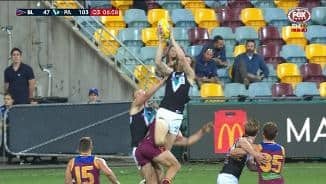 Brisbane has turned the ball over on 68 occasions and Port Adelaide has converted 29 of the resulting possession chains into scores, for a return of 99 points. This is the Power's largest score launched from intercepts since Round 23 2015. Charlie Dixon has now recorded 17 score involvements from his 20 disposals, the highest number by any player so far this season. The Port Adelaide forward has taken 12 marks (four contested) and has kicked 4.3 (27) from seven shots. Jared Polec has kicked Port Adelaide's 17th behind for the match, however five of these have hit the post. One of Brisbane's six behinds came from hitting the post. Brisbane has won three more centre clearances than Port Adelaide but the latest is just the first that has launched a goal, with Zorko kicking his ninth of the season. The Power have been able to launch four goals from centre clearance wins. In trying to limit the damage, amazingly Brisbane has currently accumulated nine more disposals than Port Adelaide. The Lions are averaging 27 disposals per scoring shot compared to the efficient Power who have averaged nine disposals per score. Mitch Robinson has been one of Brisbane's better performers in what will be a heavy defeat. The Lions midfielder has now kicked two of his team's eight goals, amassed 19 disposals and won an equal teamhigh five clearances. 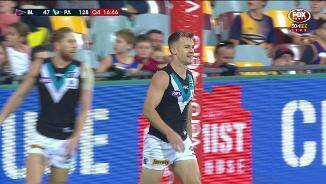 Robbie Gray has kicked his fourth goal, with three coming from general play. Playing a large proportion of the match inside 50, Gray has recorded seven of his 11 disposals within that zone, with all but one resulting in a score. Port Adelaide has now led by 75 points or greater in consecutive rounds for the first time in its history. In the third quarter the Power took six contested marks and have 13 for the match. In contrast, the Lions have taken just one for the game. Three goals in three minutes to the Power, each launched directly from an intercept. Brisbane has turned the ball over on 50 occasions and Port Adelaide has taken advantage, launching 83 points from the resulting intercepts. 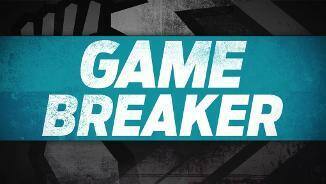 Two goals in a minute for Jackson Trengove as Port Adelaide takes the lead to a gamehigh 68 points. Spending more time forward this year, Trengove has now kicked seven goals this season, his most in any season back to his debut in 2010. Brisbane is hanging in there this term, matching Port Adelaide with four goals apiece. The Lions have improved their kicking efficiency to 67 per cent so far this term after only 58 per cent of their kicks were effective in the first half. Both teams have now won 22 clearances apiece, however Port Adelaide has been far more effective on the spread, converting six of the resulting possession chains into scores (for 26 points) compared to just a result of three behinds by Brisbane. Brisbane has capitalised on the Pittard miss, directly taking the ball from the kickin to convert via Round 5 Rising Star nomination Eric Hipwood. The Lions have scored from 7.6 per cent of kick-ins this season, ranked 14th of all teams in the league. Now a careerhigh for Impey as he kicks his fourth goal for the match. Three of his goals have come from inside 30 metres, as Port Adelaide has kicked 10.2 (62) from within this distance and 3.8 (26) from outside this range. Jarman Impey has now kicked three goals in a game for only the second time in his 60game career. The first time the Power forward kicked three in a game was in Round 6 last season against Richmond. For the second successive encounter against Brisbane, Port Adelaide has set a new a record margin (55 points) to half time against the Lions. This is also the Power's largest leading margin against any team at half time since the 2014 elimination final. Port Adelaide has not been as effective converting this quarter with four goals from 11 shots, however five of its seven misses have come from outside 30 metres. In the first term the Power kicked six of their seven goals from within 30 metres of goal. In the nine minutes since Robbie Gray's second goal, Brisbane has held onto possession and clawed back a goal. In this time the Lions have only conceded two forward 50 entries but recorded 24 more disposals than the Power. Robbie Gray only recorded one disposal in the first quarter (a goal) however is making a much bigger impact this term. Gray has already won five disposals, including four kicks, two marks and two goals. Two goals in just over a minute to Port Adelaide, as consecutive centre bounce clearances lead directly to goals. Port Adelaide outscore its opposition by 10 points per game from centre clearances this year, ranked first in the league. Three consecutive forward half intercepts to Port Adelaide and finally Dixon capitalises. The Lions are struggling to push through the Power's forward press, as the Power has already won 17 intercepts inside their forward half. Brisbane has denied Port Adelaide possession in the early passages this quarter, already registering 33 uncontested possessions in the first five minutes. The Lions only won 71 such possessions for the whole of the first quarter. Port Adelaide has kicked its highest score to quarter time since Round 3 2016. The Power completely blew the game open in the first twenty minutes, mainly through the ability to score 39 points from just 13 possession chains launched through intercepts. Chad Wingard has had an impressive first quarter, winning three clearances, delivering inside 50 on three occasions and leading all players amassing 11 disposals. This tally marks the most disposals Wingard has recorded in a quarter since Round 2 2015. Michael Close has finally put Brisbane on the board with a goal following a 50metre penalty. This is just the Lions' tenth disposals inside their forward half, compared to 58 amassed by the Power. The league average in first quarters this season is 42. Port Adelaide is in complete control with the first seven goals of the game. The Power has been far more effective in its ball use with a kicking efficiency of 74 per cent, considerably about that of the Lions at just 33 per cent. Although Brisbane has won four of the six centre clearances, its been oneway traffic towards Port Adelaide's goal after that. The Power have had the ball inside their forward half for 75 per cent of play and have recorded 10 more forward 50 entries. The Power is having no troubles scoring on the run, with 4.2 (26) of their 33 points scored from general play. 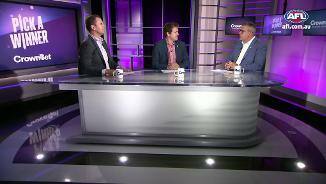 This season Port Adelaide averaged 49 per cent of its total score from shots in general play, the fourth highest proportion in the competition. Brisbane has already turned the ball over nine times in 51 disposals, compared to Port Adelaide with just four turnovers in 52 disposals. The Power are capitalising on the Lions' mistakes with six scores launched from their nine intercepts. A great start for Port Adelaide kicking the first three goals. Before today these sides have been the best two starters in the league, with the Power outscoring their opposition by 32 points and the Lions by 34 points in the first ten minutes of games. Brisbane has conceded time in possession differential to its opposition by an average of five minutes and 35 seconds per game this season (ranked last), while Port Adelaide has compared more favourably at just 27 seconds per game to the negative. These sides have had contrasting outcomes from clearances this season, with Port Adelaide outscoring its opposition by an average of 15 points (ranked second) whilst Brisbane has been outscored by an average of 17 points (ranked 17th) from that source. Welcome to Gabba for the Brisbane Lions v Port Adelaide Round 6 clash. 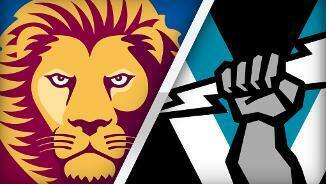 PORT Adelaide has stormed into top-four contention, making mince meat of the Brisbane Lions by 83 points at the Gabba on Saturday night. The Power forward line ran riot, with Charlie Dixon, Jarman Impey and Robbie Gray all kicking four goals in the 22.18 (150) to 10.7 (67) romp. Port's fourth win from six matches was effectively sealed in the opening 20 minutes, when they slammed home seven unanswered goals. 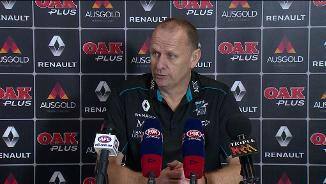 Coach Ken Hinkley was delighted with his team's display. "(It was a) really strong performance again against a side in reasonable shape themselves, albeit they're a bit younger, their midfielders have been dominant and they've been in games," Hinkley said. "To come up here on their home deck, which I'm sure they were setting themselves for, we were pretty strong I reckon. "I thought today was pretty comprehensive in the amount of time we controlled the game." The Lions have now lost five games straight and had little answer in easily their worst loss under new coach Chris Fagan. They butchered the ball in the first quarter with 20 clangers – a number that grew to 35 by half-time - and Port made them pay. "We didn't see it all week, this coming, we'd trained well," Fagan said. 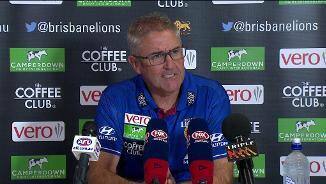 "There was a positive attitude after the loss to the Bulldogs, which was a really competitive game of football ... we were thinking tonight we'd be pretty respectable, but we weren't." Missing skipper Travis Boak with a hamstring injury made little difference, as Chad Wingard (31 disposals, seven clearances) stepped into a more prominent midfield role to be arguably the best player afield. Brad Ebert (25 touches) shook off close attention from young Lion Jarrod Berry, while Sam Powell-Pepper (25 and two goals) and Jasper Pittard (25) were also instrumental in victory. 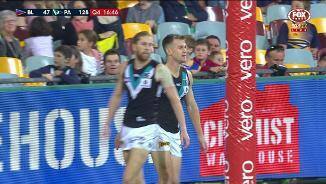 Port was desperate all game, starting with Aaron Young's super tackle of Sam Mayes in the opening minutes that led to a Jackson Trengove goal. Impey kicked two early goals and Dixon - too big and strong for undersized Dan McStay – kicked two of his own as Port silenced the home crowd. The Lions' only respite in the opening quarter came when Michael Close kicked their first goal courtesy of a 50m penalty. But the pain relief was temporary. To the Power's credit, they did not let up, extending their lead at every change for the percentage-boosting win. One three-minute burst in the third quarter epitomised the gap between the teams. It started when Trengove ran with the flight of the ball to mark among three Lions and continued his path unchallenged into an open goal. 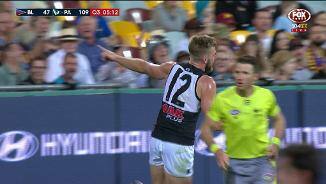 A minute later he added another after Nick Robertson – who was one Lion who gave his all – missed a handball target, and 60 seconds later stand-in skipper Ollie Wines took an uncontested mark from a Gray pass to continue the slaughter. It was a bleak day for the Lions, with their midfield thoroughly outplayed despite winning the disposals (400-386) and clearances (37-34). Port was far more slick and their pressure around the ball carrier taught the Lions a lesson. 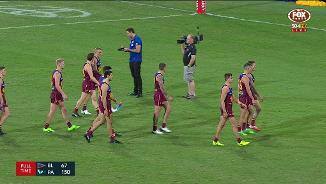 Brisbane Lions: One glimmer of light for the Lions was no injury concerns. Tom Cutler got through unscathed after returning from a hamstring problem to gather a team-high 28 disposals. Port Adelaide: The Power also got through unscathed and will be hoping Boak can return from his hamstring problem to take on the Eagles next weekend. Following big victories against battlers Carlton and the Lions, Port will look to make it three wins in succession next Saturday afternoon when they host West Coast at Adelaide Oval. The Lions travel to Sydney to take on the winless Swans at the SCG on Sunday afternoon, trying to snap a five-game losing streak.